"Multiple launch rocket system" redirects here. For the U.S. Army system known as "MLRS", see M270 Multiple Launch Rocket System. An illustration of a handheld portable multiple rocket launcher as depicted in the 11th century book Wujing Zongyao of the Song Dynasty. 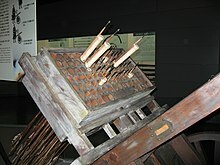 The launcher is constructed using basketry. Korean Joseon hwacha multiple rocket launcher (designed in 1409) in a museum. BM-13 Katyusha (in service from 1939). 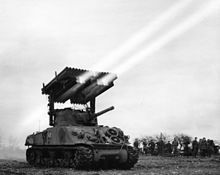 American T34 Calliope (designed in 1943) in action. 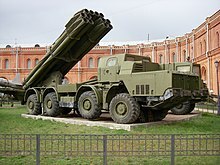 Monument of BM-21 Grad 122mm multiple rocket launcher system in Tula. Launcher 9P140 of 220-mm multiple rocket launching system 9K57 BM-27 Uragan in Saint Petersburg artillery museum. BM-30 Smerch 300mm rocket launcher in raised position (Saint Petersburg artillery museum). A multiple rocket launcher (MRL) or multiple launch rocket system (MLRS) is a type of rocket artillery system. Rockets have different capabilities than artillery, like longer range and different payloads, typically considerably larger warheads than a similarly sized artillery platform or multiple warheads. Unguided rocket artillery is notoriously inaccurate and slow to reload compared to artillery. To overcome this rockets are combined in systems that can launch multiple rockets simultaneously. Modern rockets can use GPS or inertial guidance to combine the advantages of rockets with high accuracy. The first multiple rocket launchers were made during the mediaeval Chinese Song dynasty. It was designed to launch multiple rocket arrows from a gunpowder box. These also appeared later, in an expanded version, in the Joseon Dynasty of Korea where they were used with great effectiveness against the Japanese invasions of 1592–98, most notably the Battle of Haengju. In parallel with Song Chinese development of guns and cannons the Song military invested great efforts in producing military rockets, including multiple rocket launchers mounted on wheelbarrows. 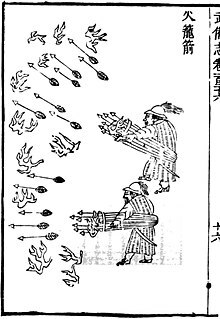 Multiple rocket launchers evolved from Chinese fire lances when the Song military favored multiple rocket launchers that fired up to 100 small fire-arrow rockets simultaneously after the Mongol siege of Kaifeng. The typical powder section of such an arrow-rocket was 1/3 to 1/2 ft (10 to 15 cm) long. Bamboo arrow shafts varied from 1.5 ft (45 cm) to 2.5 ft (75 cm) long and the striking distance reached 300 to 400 paces. The Chinese also enhanced rocket tips with poison and made sure that the launchers were also mobile. Song Chinese rocket designers designed multiple rocket launchers that could be carried and operated by a single soldier. European armies preferred relatively large single-launch rockets prior to World War II. Napoleonic armies of both sides followed British adoption of Mysore Army. These were explosive steel-cased bombardment rockets with minimal launchers. European navies developed naval multiple launcher mounts with steadily improving explosive rockets for light and coastal vessels. These weapons were largely replaced by conventional light artillery during the late nineteenth century. The first self-propelled multiple rocket launchers — and arguably the most famous — were the Soviet BM-13 Katyusha, first used during World War II and exported to Soviet allies afterwards. They were simple systems in which a rack of launch rails was mounted on the back of a truck. This set the template for modern multiple rocket launchers. The Americans mounted tubular launchers atop M4 Sherman tanks to create the T34 Calliope rocket launching tank, only used in small numbers, as their closest equivalent to the Katyusha. The Germans began using a towed six-tube multiple rocket launcher during World War II, the Nebelwerfer, also called the "Screaming Mimi" by the Allies. The system was developed prior to the war to skirt the limitations of the treaty of Versailles. Later in the war the 15cm Nebelwerfer 41 was mounted on modified Opel Maultier "Mule" halftracks becoming the Panzerwerfer 42 4/1. Another version produced in limited numbers towards the end of the war was a conversion of sWS (SchwererWehrmachtSchlepper) "heavy military transport" halftrack to a similar configuration as the Panzerwerfer 42 4/1 mounting the 10-barreled 15cm Nebelwerfer. Another German halftrack MRL system was inspired by the Russian BM-13. Keeping the Soviet 82mm rocket calibre as well as the launch and rocket stabilisation designs it was developed into a system of 2 rows of 12 guide rails mounted to the Maultier chassis; each providing the capacity for 24 rockets (rockets mounted underslung as well as on top of the rails) for 48 rockets total. This vehicle was designated as the 8cm Raketen Vielfachwerfer "8cm multiple rocket launcher". As the launch system was inspired by and looked similar to the BM-13 which the Germans had nicknamed "Stalin-Orgel" or "Stalin-Organ" the Vielfachwerfer soon became known as the "Himmler-Orgel" or "Himmler-Organ"
With tubes or pipes, in modern times usually made of steel - non removable from launcher, with options to be reloaded in on the battlefield with rockets loaded manually or semi-automatically. This was the most usual type until the 21st century. It is more convenient for battlefield usage because it does not require special tools to reload modules and test them before using them on launchers as with other types. With containers, pods or modules that can be removed from the launcher and quickly replaced with same or different types of rockets and calibres. They are usually reloaded at factory or within specially-equipped army workshops. These are more modern types of weapons as they are not necessarily related to just one type of rocket and give more options to commanders on field to deal with different tactical situations using different types of rockets or to quickly reload. They are also easier to upgrade for different/new types of rockets. Simple MRL types still have a reputation of having a devastating morale effect on ill-disciplined or already shaken troops. The material effect depends on circumstances, as well-covered field fortifications may provide reasonable protection. MRL are still unable properly to engage reverse slope positions in mountain warfare because it is more difficult to determine the trajectory compared to that of a howitzer by adding or removing propellant increments. Simple MRL rocket types have a rather long minimum firing range for the same reason. An approach to lessen this limit is the addition of drag rings to the rocket nose. The increased drag slows the rocket down relative to a clean configuration and creates a less flat trajectory. Pre-packaged MRL munitions such as those forMLRS do not offer this option but some MRL types with individually-loaded rockets do. Improvised multiple rocket launchers based on helicopter- or aircraft-mounted rocket pods (typically of 57–80 mm calibre) especially on light trucks and pickups (so-called "technicals") are often seen in civil wars, when rebels make use of captured launchers and munitions. The Convention on Cluster Munitions has led to the destruction and cessation of production of most cluster munitions for MRLs. Large sub-munitions, smoke agents, and unitary high explosive warheads are still permitted under the Convention. Included among the still-legal sub-munitions are relatively large Explosively Formed Projectile (EFP) warheads with sensors (millimetre wave radar, infrared) which search the ground for tanks to attack in a spiral pattern during their descent (retarded by parachutes). Western examples are SMArt 155, 155 Bonus, and SADARM. Modern MRL systems can use modern land navigation (especially satellite navigation such as GPS) for quick and accurate positioning. The accurate determination of the battery position previously required so much effort as to make a dispersed operation of the battery impractical. MRL systems with GPS can have their MRLs dispersed and fire from dispersed positions at a single target, just as previously multiple batteries were often united on one target area. Radar may be used to track weather balloons to determine winds or to track special rockets which self-destruct in the air. The tracking allows determination of the influence of winds and propellant temperatures on the rocket's flight path. These observations can then be factored into the firing solution for the rocket salvo for effect. Such tracking radars can also be used to predict the range error of individual rockets. Trajectory correcting munitions may then benefit from this, as a directional radio may send a coded message to the rocket to deploy air brakes at just the right time to correct most of the range error. This requires that the rockets were originally aimed too far, as the range can only be shortened by the air brakes, not extended. A more sophisticated system makes use of radar data and one-way radio datalink to initiate a two dimensional (range and azimuth) correction of the rocket's flight-path with steering by fins or nose thrusters. The latter is more common with systems which can be used to upgrade old rockets and the Israeli Accular is an example. Fin-stabilised rockets also allow for easy course corrections using rudders or minute charges. Guided munitions have been introduced to exploit this. Guidance principles such as GPS satellite navigation, inertial navigation systems and semi-active laser seekers are used for this. This improves dispersion from a CEP of hundreds of metres at dozens of kilometres range to just a few metres and largely independent of the range of the round (except for INS, as INS navigation creates a small dispersion that's about proportional to range). This in turn made great increases of rocket (or missile) ranges useful; previously dispersion had made rockets too inefficient and often too dangerous to friendly troops at long ranges. Long range MRL missiles often fly a higher quasiballistic trajectory than shorter ranged rockets and thus pose a deconfliction challenge, as they might collide with friendly aircraft in the air. The border between a MRL missile and a large anti-tank guided missile such as Nimrod has become fuzzy due to guided MRL missiles such as M31 GUMLRS. ^ James, Peter J.; Thorpe, Nick; Thorpe, I. J. (1995). Ancient Inventions. Ballantine Books. p. 238. ISBN 978-0345401021. ^ Gruntman, Mike (2005). Blazing the Trail: The Early History of Spacecraft and Rocketry. American Institute of Aeronautics. pp. 5–6. ISBN 978-1563477058. ^ "BONUS Mk II". www.deagel.com. Archived from the original on 2014-08-19.